You may have come across Ryk Mead as the leader of The London Blues Machine on the British and European circuits or when they released their tasty mix of originals and one cover on an album called Chicago in 2015. Since then he has been as busy as ever with touring as he always has…he started gigging in the late 60s and has shared the stage with such luminaries as Dave Gilmour, Annie Lennox, Alison Moyet, The Pretty Things, Steve Waller (Manfred Man’s Earth Band), Paul Fox and Dave Ruffy (The Ruts), Elmer Gantry and many others. This mixed genre experience has continued to inform his writing and playing styles although, as the new album title suggests it has always been Me And The Blues that ruled the heart. 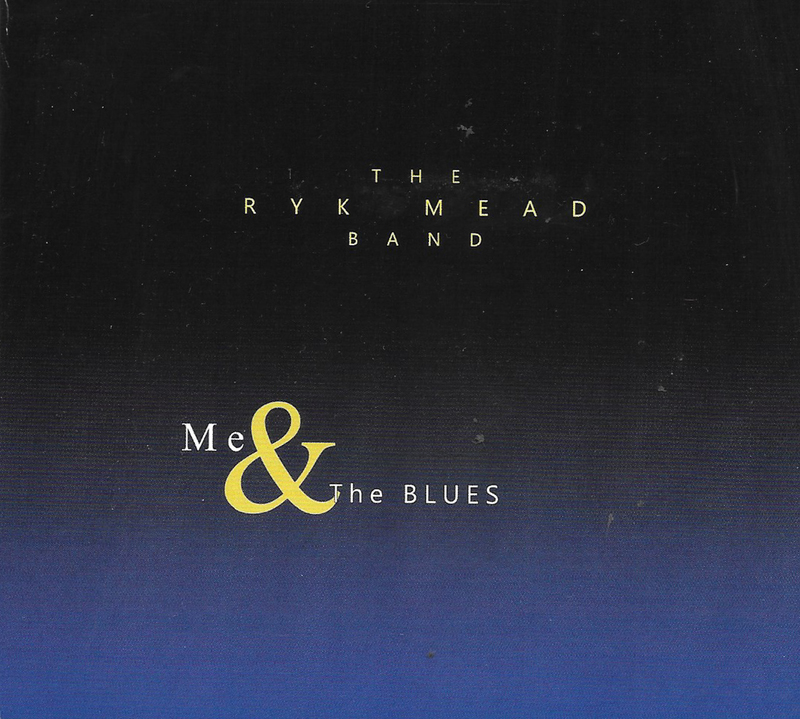 This release is under the Ryk Mead Band moniker, although it seems the name is interchangeable, and is a value-packed double album of all original compositions, encompassing true blues, rock and jazz and covering virtually every era in the inspirations behind them. Ryk is also one of the guitarists who understands why it is not the number of notes, but how they are played and how sustain and silence can make a good solo great that gives increased credence in my view. In playing with that sensitivity, he inevitably reminds me of Clapton or Moore in his expression and interpretation of the blues. As a double CD with sixteen tracks, I won’t dissect every one but discuss the first tracks on each as, it is accepted that the initial track should capture the attention straightaway and I still hold to that principle even in theses days of streaming and downloads. I will also choose some of the highlights across the work…not an easy task, but enjoyable nonetheless. Disc One opens with Climb That Hill and does the job just described as it gives an immediate sense of blues that will rock, and so it proves after the initial riff is played with a slight discordancy and then it just continues to build until we get a blues song of Clapton quality circa Blind Faith. The solo is neat and restrained over sparse chords and has a complexity that means a couple of listens before all of the nuances can be appreciated. The second half also has some lovely lead runs between the vocal lines. This doesn’t break any moulds, but it is a brilliant blues-rock opener. Before You Go is a blues ballad that evokes Moore and Green with exquisite guitar phrasing over a simple bass and snare rim backing. At first, I feared a Parisienne Walkways pastiche, but then the whole thing lifts to a unique exercise in blues soloing as each note wrenches emotion out of the strings and explores all six of them too…whereas many guitar players would be on frets twenty and twenty-one and widdling! The lyrics will also resonate as much as the guitar with many people, and the odd waver in the voice adds passion. Fire And Rain ups the pace with a Clapton plays Kossoff style of lovely blues…the fire and water references are purely coincidental. The solo again shows careful use of notes, and bends are inserted when they suit the piece and not for the sake of it. If That’s What Takes wraps up Disc One with a mid-paced blues of the kind that Bernie Marsden is so good at; the solo here takes on a slight country twang as the tone differs and complements the drift of the melody. First track on the second disc is Last Man Standing; a great riff kicks it off and, mildly disappointingly, it doesn’t develop in the heavy way I was expecting and hoping for…still a damn good song though. Looking For My Baby takes the Berry and BB approach to a joyous and lilting slice of rhythm and blues. The solo this time is picked with precision and a tone that evokes the 60s beautifully. That’s The Blues is a perfect description for this slow Trower styled song…it could be on Bridge Of Sighs and stand proud. Time Will Set Me Free has sax to colour parts of this one; it does work well and complements the guitar which carries the melody with Ryk’s trademark sound and feel. Penultimate track, Rollin’, is a jaunty slice of blues with a neat riff that is out of the Cream songbook. Closer is the neatly titled After You Go; it’s an instrumental version of Before You Go and, whilst it isn’t different, it does allow you to hear all of the guitar inflections that Ryk shoehorns into a lovely slow blues. Sixteen enjoyable tracks that may not break any new ground but if you like the Clapton, Moore, Trower kind of blues soaked albums, then you are going to really like this (these) too. Each track is an example of carefully crafted variations on blues across the years, wrapped up in a modern electric package. It is an album that rewards close listening as, as I have said here and many times before, when a guitar is played with precision and feel, the pleasure is augmented by that subtlety. Give it a listen; I doubt you’ll be disappointed. Thanks you so much for your review. It means a great deal to know that you have listen intently and with insight and responded to what you heard and what lies beneath the surface. Again spot on with the observation that Me & The Blues has been about the journey. i look forward to continuing the journey and hope to include your insights as a sign post to point the way to those who those who want to follow.